The Turkish lira rose against the US dollar, rebounding after Friday’s huge slump, today after Turkey’s President Recep Tayyip Erdogan warned investors speculating against the currency that they will be punished. 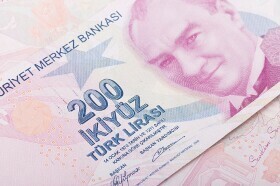 The bounce was limited, though, and currently the lira is trimming its gains. If you get involved in provocative acts, saying ‘foreign currencies will strengthen, this will happen, that will happen’, you will pay a very heavy price . . . The BRSA has taken some steps. I will make you pay a very heavy price. The lira slumped heavily on Friday due to fears of a new global recession caused by poor macroeconomic data in the eurozone, Germany in particular. USD/TRY fell from 5.7438 to 5.6879 as of 12:02 GMT today, touching the low of 5.5695 intraday. If you have any questions, comments, or opinions regarding the Turkish Lira, feel free to post them using the commentary form below.